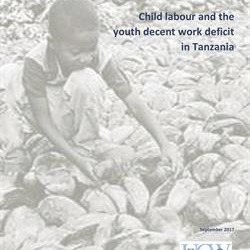 Abstract : This report examines the related issues of child labour and youth employment in of Tanzania. Guided by observed outcomes in terms of schooling, work activities and status in the labour market, the report considers the economic as well as social determinants of child labour and youth employment. The Tanzania Integrated Labour Force Survey 2014 (ILFS, 2014) is the primary data source for the report. Data from this survey permits a comprehensive and nationally representative picture of the situation of child labour and youth employment. The previous two rounds of the Integrated Labour Force Survey, 2000–2001 and 2006are used to discuss the trends of child labour and youth employment. The Report was developed within the framework of the National Strategy on Elimination of Child Labour 2018 -2022. As such, it provides an important common basis for action in addressing child labour and the youth decent work deficit in Tanzania.